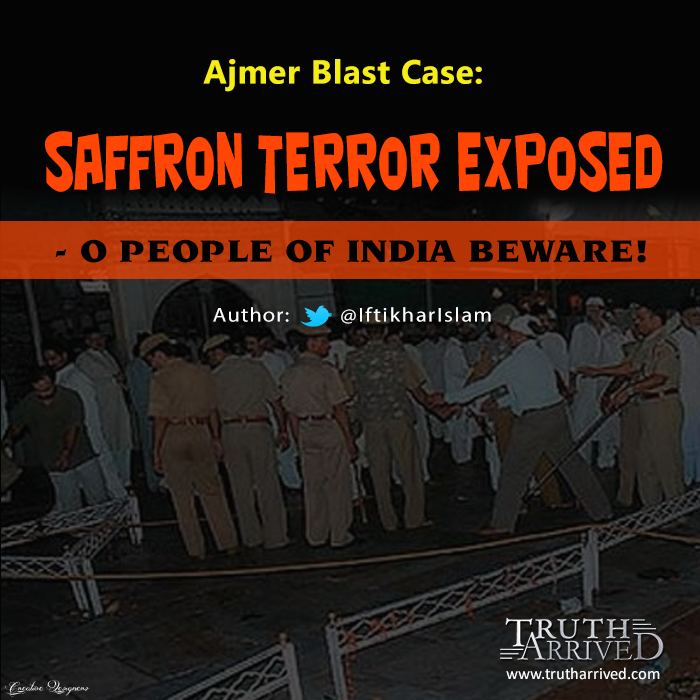 Home / Chief Editor / Iftikhar Islam / On The Target / Saffron Terror / Terrorism / Editorial: Ajmer Blast Case: Saffron Terror Exposed – O people of India beware! In the recent judgment of the 2007 Ajmer Dargah Bomb Blast Case, the National Investigation Agency (NIA) special court has convicted three saffron terrorists, two were the former affiliates of RSS. Sunil Joshi, Devendra Gupta, and Bhavesh Patel are among the convicts out of 13 accused. Seven, including Swami Aseemanand, are acquitted. Leaving about Swami Aseemanand’s acquittal, even after his confession before the Tis Hazari court in Delhi, it is clear that the three who got convicted are the face of Saffron Terror. However, in the year 2007, after the blast took place, every one – almost all – were of the opinion of Muslims committing this heinous crime. The Rediff News reported “Union Home Ministry sources in Delhi said it was a terror strike in which militants had used a low-intensity improvised explosive device.” The moment we hear the word “Militant” we suspect “Muslims” behind the crime. The Rediff News continues, “They said the terror outfits, including Pakistan-based Lashkar-e-Tayiba, were against Sufi Islam and they could be prime suspects behind the blast at the shrine, respected by both Hindus and Muslims, which came barely 10 days ahead of the meeting of Indo-Pakistan anti-terror mechanism on October 22.” People were made to believe that Muslims are behind the attack on the Sufi holy shrine. How easy it is to fool the people in the name of differences and disagreements? How easily we point a finger on someone and make them culprits. We become our own advocates… We become our own judges… And we think, it is our judiciary. It is very easy to target a single sect and blame them for the acts that they cannot even imagine to do. How easy is to fool the Muslims by just pointing a finger towards a particular sect? At least, by now, people should understand that Saffron Terrorists are working towards the destruction of peace in the society. There are many other attacks and blasts that have happened in the country, we need to check the saffron link in the attack and expose them for the sake of peace in the society. Remember, these are the goons who doesn’t believe in the concept of ‘Unity in Diversity’. The beauty of India lies in the different cultures living together peacefully. Let’s build that India again where the people of different faiths lived together in harmony and peace. Iftikhar Islam is the Chief Editor of the Truth Arrived.